Imagine it now: your tanks crewed not by green conscripts, who only wish to see the war end so that they can return home, but killer ponies who are out for blood. Your war machines, once all too fragile, now so strengthened by pony magic that they leave rainbows in their wake. Pony warsongs blast through your speakers, while your crew chomp down on consumables like salads and love potions. We’ve always said that war is hell, but now we have the proof. You may remember we covered My Little Pony for Minecraft a few months back. Well, as you can see, our four-legged friends get around. 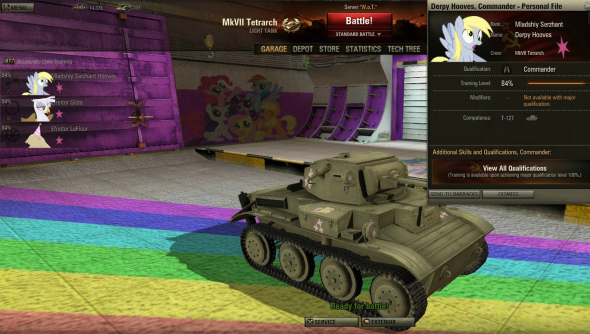 This total conversion package, which is a whole host of mods collected together into one gigantic megamod, clocks in at an impressive 6 gigabytes and leaves almost no elements of World of Tanks untouched. 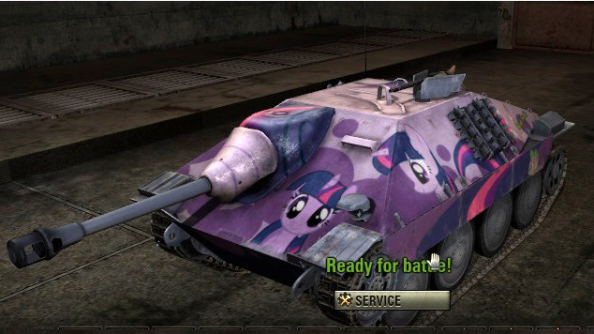 It’s no surprise that it’s so big, since as well as endless graphical tweaks including skins and decals, it also includes more than ninety audio tracks just bursting with pony magic. Even the nations have been renamed, with the Germans now known as The New Lunar Republic. 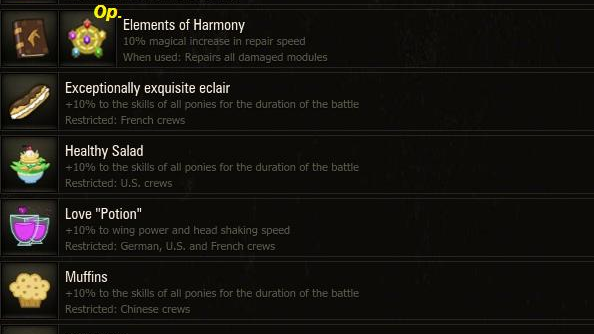 Installing this mod can be a little bit fiddly and, to be safe, you’ll want to make sure you start with a clean install of World of Tanks, with no other mods lingering in your res_mods folder, just in case. Your best best for downloading the mod is via torrent, which you can grab here, but if you can also pick and choose the elements you want to include, perhaps leaving out the music but keeping the skins and other sound effects. The official World of Tanks forum thread for the mod compilation can be found here and if you scroll down to “Downloads” you’ll see how the different elements are broken up. One of the best things about this mod compilation is the included patcher, which you can run to update all of the mods (except for two music packages) and thus save yourself a lot of update hassle. Not bad, eh? Now get out there and rain pony death upon your foes.